The rest of the story came out during testimony before the coroner’s jury. Purdy Pharis’s neighbors Hiram Haskins and Emanuel Stevens were overnight guests of Pharis. In the evening, the men said, they heard a sound coming from Purdy’s bedroom, “like the dropping of a boot on the floor,” followed by moaning. Early the next morning they again heard moaning. But this time they broke down the door and found their host, Sheldon Purdy Pharis dead. His revolver lay in front of him, they testified, with one bullet having been fired. The verdict of suicide was signed by seven of Purdy Pharis’s neighbors, all respectable men who had lived on Kings Mountain for decades. According to “Sawmills in the Redwoods”, because Purdy Pharis was held in high esteem–and Hiram Haskins was not–the jurors would have been careful to recognize any inconsistencies in his testimony. Also–Woodside dentist Dr. Tripp confirmed that Purdy Pharis had a troubled mind. The only possible reason Purdy Pharis would have taken his own life, some believed, was because he was suffering from a mental illness. Others have noted that the bullet entered the back of Purdy’s head–evidence of foul play. The county coroner ruled suicide but for years a neighbor was believed to have murdered Purdy Pharis. Had the shooting occured today there might have been a different verdict. At the funeral in Redwood City, crowds came to pay their last respects to the Peninsula’s 19th century Shingle King. Many remained unconvinced Purdy Pharis had [or would] take his own life. The full story of what happened to Sheldon Purdy Pharis at his Kings Mountain home in 1884 may never be known. …Then, natural disaster struck in 1890. Farmers paid little heed to warnings and continued to burn straw piles and brush. Then one day, carelessness ignited a blaze. Whipping winds spread the fire–and soon it was out of control, heading in the direction of the Purisima. 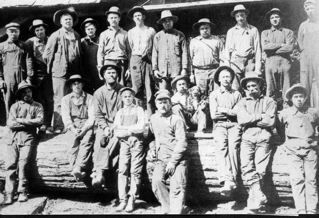 To fight the conflagration, the saw mill owners banded together, summoning all available woodchoppers and other crew members. But the rush of hot flames moved too quickly, threatening both Purdy Pharis’ shingle mill and Borden & Hatch’s lumber mill. When the fire was finally out, the mill owners stood among the embers of financial ruin. All that remained were charred redwood logs. Purdy Pharis’ mill sustained serious damage and the fire gutted the Borden & Hatch Mill–but both mills would be restored. Four years later in 1884, friends of Purdy Pharis reported that the “Shingle King” was acting out of character. He began to believe that people talked about him behind his back and were against him. Some blamed his solitary existence, pointing out that Purdy spent too much time alone on his 6,500 acre ranch. Neighbor Hiram Haskins became so concerned, according to “Sawmills in the Redwoods,” that he summoned Dr. Tripp, the dentist who could be found at the historic Woodside Store, Tripp talked to Purdy and urged him to see a physician in Redwood City–but the independently-minded Purdy Pharis would have none of it. The Shingle King lived off Starr Hill Road on the rim of the Corte Madera Canyon. To the west the rustic house featured spectacular far-off views of the Pacific Ocean–and to the northeast, glimpses of San Francisco. Purdy Pharis’ friends, Hiram Haskins and Emanuel Stevens, lived nearby. Little is known about Stevens but HIram Haskins had been a stage driver in Arizona. He was not particularly well liked by his neighbors on the mountain. They regarded him a gruff and unrily “hermit” but Purdy Pharis liked him. Purdy’s shingle business grew and he prospered, according to retired County Sheriff John G. Edmonds, author of “Union Cemetery, Redwood City,” the site where the “Shingle King” lies buried. He eventually produced 3 million shingles, writes Edmonds and was a respected employer with a national reputation. Purdy Pharis was highly regarded–but the Borden & Hatch lumber mill gained even greater fame, becoming a household name–especially after the Spring Valley Water Company awarded the mill a lucrative contract in the 1870s. Spring Valley’s contract required Borden & Hatch to deliver a 9-mile flume created from the strongest and most durable wood. The device had to be of first quality, as it carried the water from the upper levels of Montara Mountain. The mill owners did their job well. They cut the very best trees in the Purisima, and the flume endured for two decades. But after the contract–when the prosperity and the heady feeling it produced had passed–things got very quiet in the Purisima. The lumber was depleted and the hard times hit, fueled by a general economic depression. Then, natural disaster struck in 1880. “The Purisima” (pardon me for spelling two different ways: Purissima, now Purisima) is located south of Half Moon Bay and west of present day tree-lined Skyline Blvd near somewhat remote Kings Mountain. Purdy Pharis’s mill stood in the middle of nowhere and the frustration of moving large bundles of shingles to market quickly led to experimentation. After a while Purdy sought the services of an outside engineer who built a mile-long tramway and cable, with a lift of 1,000 feet, which transported hundreds of shingles from the depths of the beautiful canyon to the breathtaking mountaintop. But serious accidents put an abrupt end to the experiment. Purdy wasn’t working alone in the Purisima. Besides his tough crew, in the immediate vicinity stood the famous George Borden and Rufus Hatch lumber mill. South of the top of Kings Mountain stood “Grabtown”–a temporary “village” and resting place for tired loggers moving wood from the dark green canyons to the busy port of Redwood City. To the west in the direction of the Pacific Ocean, where the forest abruptly ended, farmer Henry Dobbel was busy planting rows of potatoes that would be shipped to San Francisco. But apparently the notoriety didn’t spoil him. When Purdy’s employees tried to demonstrate their esteem for him by shining his dirty boots, according to “Sawmills in the Redwoods,” Pharis seemed embarassed and looked for the nearest dust piles to dirty them once again. It was the fall of 1853, and the stunning madrone trees’ berries were turning red when Purdy Pharis first set foot on Kings Mountain. According to legend, he lost his way hiking in the trail-less forest. After wandering about all night, Purdy stumbled into a camp at sunrise and met a friendly fellow who was busily making shingles with a saw and axe. He was producing them from the redwood scraps left behind by the loggers–leftovers the lumbermen considered worthless. The encounter led Purdy to conclude that a single person could handle the shingle business–in stark contrast to the lumber mill owners who had to hire different crews for each step, from the loggint to the finished lumber. Most enticing about shingle-making ws that not only could one person produce them, one person could carry them out of the isolated canyon riding a pack horse. By contrast, lumber mill owners had their hands full maneuvering the huge logs from the forest to market. The book, “Sawmills in the Redwoods”, published by the San Mateo County History Museum in 1967, tells the story of the men who occupied the Peninsula’s redwood forest in those early years. Author Dr. Frank M. Stanger demonstrated how one man easily could manage the shingle business. In the book, he described how Purdy Pharis could have helped himself to a tree, chopped it down, sawed it into a shingle or shake-length blocks, and finally split the blocks into finished shingles or shakes. After meeting that man in the logging camp, according to local lore, Purdy Pharis went into the shingle business for himself. He started on a small scale but when outside demand increased, Purdy expanded by establishing a shingle mill, with bunk and cookhouse in the beautiful and isolated, deep and narrow Purissima Canyon. In 1884 a coroner’s jury determined that Sheldon Purdy Pharis had taen his own life at his Kings Mountain home–but some friends and neighbors remained skeptical, suspecting that the 55-year-old “Shingle King” actually might have been murdered. At the time of his death, Purdy Pharis was a well-respected mill owner who had resided in the San Mateo County redwoods for more than three decades. He was a lifelong bachelor,a solitary fellow who loved the outdoors. Purdy Pharis was 25 when he made the trek from his native New York to California in 1853, via the Isthmus of Panama. There was the mandatory short stint in the gold fields but Purdy never mined a nugget–the majestic redwoods south of San Francisco would shape his future. A different kind of “gold rush” was taking place in the “City by the Bay”. There was an insatiable appetite for lumber to build houses, stores, hospitals and more. The lumber was in a beautiful but remote forest of redwood trees on the Peninsula, next door to San Francisco. (Redwood, a treasured wood, is soft, resistant to rot and insects, and easy to work with). A few lumber mills already had appeared, but getting the lumber out of the deep, narrow canyons was a monumental challenge–and the man who solved that problem could make a fortune.